On 2 February 2018, the Jakob-Herz Prize has been awarded for the fifth time. The award honors outstanding scientific success in the whole field of theoretical and clinical medicine. This year’s awardee was Professor Laurence Zitvogel, MD, PhD, from Paris who is widely recognized for being a pioneer in the field of oncology and for her innovative achievements in the field of cancer immunotherapy. The Dean of the Faculty of Medicine, Prof. Dr. Dr. h.c. J. Schüttler, heartily welcomed all present and gave an short overview on the life and work of Jakob Herz. He greeted the awardee in French and congratulated her on her success, pointing out her cooperation with the Faculty in the field of oncology. The President of the FAU, Prof. Dr. J. Hornegger, emphasized the translational aspect of research at and within FAU. He was very happy that a woman received the prize this year. The Mayor of Erlangen, Dr. F. Janik, remembered how important it is for Erlangen and FAU that this prize is a permanent one as both parties should always remember their inglorious behavior during the Nazi regime. For him, the prize is both, an award and a political symbol, showing that Erlangen has learned its lesson. Prof. Dr. A. Mackensen, Director of the Department of Medicine 5, has been knowing the laureate for more than 20 years and holds her enthusiasm and engagement for her research in estimation. This enthusiasm clearly became apparent for the audience during Prof. Zitvogel’s vivid presentation. Two musicians in the tradition of Klezmer music bordered the prize giving ceremony: Marcus Stadler from the trio Trigane played the accordion and Leonid Khenkin the clarinet. Professor Laurence Zitvogel, MD, PhD, is scientific directress at the Gustave Roussy Cancer Center in Villejuif, France, and director of group 1 research unit Tumor immunology and immunotherapy of cancer. She is also professor of immunobiology at the University of Paris XI Medical School. Already at the age of six she knew that she wants to become a doctor. When working on the oncological ward, she realized that she wanted to dig deeper into research in order to find ways that help to loose less and less cancer patients. So far, the classical cancer treatment consisted of radiotherapy, chemotherapy, and surgery. She was convinced that killing cancer cells was not the only treatment option. During her intensive research – where, by the way, she although came to know her now husband, Prof. Dr. Guido Kroemer, a molecular biologist and expert on apoptosis -, she developed the concept of immunogenic cell death and could show that chemotherapy, radiotherapy and inhibition of tyrosinkinase only are effective against cancer (at least in parts) with the help of the immune system. Not only, but also thanks to her successful research, classical cancer treatment has expanded by two new fields, i.e. targeted therapy and immunooncology. Prof. L. Zitvogel’s current research is divided into three main areas. First, she is studying different modes of action of immune checkpoint inhibitors and looking for predictors of response to immune-modulation. Second, Prof. L. Zitvogel is trying to characterize how the gut microbiome plays a part in cancer immune-surveillance. Finally, she is working to identify the molecular mechanisms behind immunogenic cell death, a form of cancer cell death that triggers the activation of T-cells toward the remaining cancer cells. Prof. L. Zitvogel has published more than 452 papers, quite a few of them in high ranking journals, such as „Nature Reviews Immunology“, „Science“ and „Nature Medicine“. Since 2012, she has been member of France’s National Academy of Medicine as well as a permanent member in the European Academy of Cancer Sciences. In 2017, Prof. Dr. L. Zitvogel was (among others) awarded the Charles Rodolphe Brupbacher Prize for Cancer Research and in 2014, she received the SWISS BRIDGE Award for Cancer Research. Prof. L. Zitvogel was delighted to be awarded this prize and thanked all her longstanding national and international collaborators that were essential for her success. She also emphasized the long, intensive and fruitfull cooperation with the Faculty of Medicine, especially with Prof. Mackensen’s group and the team at the Department of Dermatology (Prof. Schuler and his wife). In cooperation with the Research Foundation of Medicine (Universitätsklinikum Erlangen), the Faculty of Medicine biennially awards the Jakob-Herz Prize which consists of 10,000 EUR, donated by the Research Foundation of Medicine, and a certificate. Jakob Herz was a prominent physician and researcher from Erlangen who became the first Jewish professor in Bavaria. He died on 27 September 1871 as a consequence of his selfless care for his patients. The Jakob-Herz Prize honors outstanding scientific success in the whole field of theoretical and clinical medicine. Both, individual achievements in research as well as lifetime achievements, can be honored. The prize giving ceremony is organized by the Faculty of Medicine. This year’s prize giving ceremony was special in so far as the awardee was presented a (unique) painting by a local artist (Ilonka Münsterer-Maar) especially made for this event. 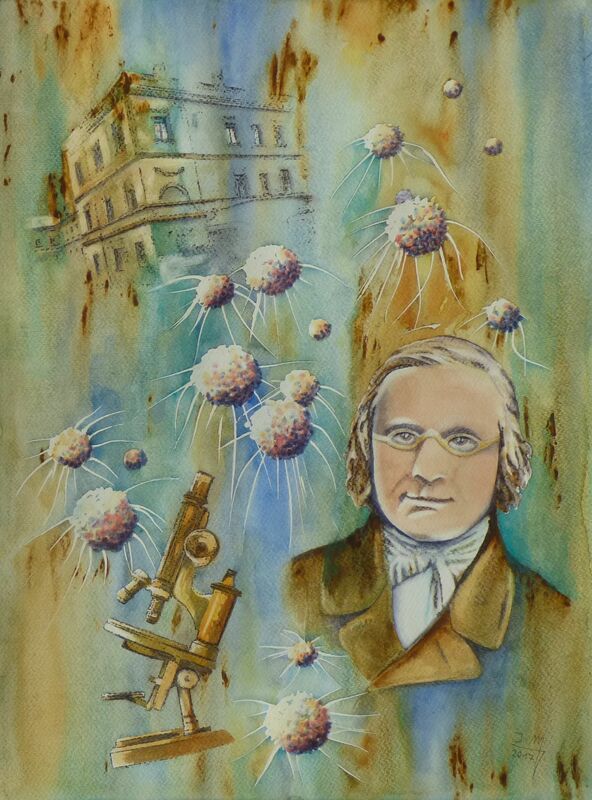 The painting shows besides the original building of the university hospital a portrait of Jakob Herz as well as cancer cells.